Runs very quietly while in operation! A precision and perfect helical head planer, the Steel City Tool Works 40300H looks like it means business. Even though there are many thickness planers that you can choose from, not many of them have all of the great features that you will find in this Bench Top Portable Planer. Whether you need boards for flooring, rafters, or any other project that requires boards that are of an even thickness, the 40300H thickness planer will allow you to complete all of your woodworking projects with ease and precision. This planer is the sous chef of the wood kitchen. This planer is ready to go right out of the box. The only assembly required is that you have to install the crank handle and the dust port. The crank handle installs on the right hand side of the unit by using the included hex wrench. The dust port easily attaches to the back of the cutterhead by a simple screw. The left side of the unit features an area where you can wrap up the chord as well as a built in toolbox that holds the included T-wrench, which is used to change the cutter head and the hex wrench. The unit also has a safety on/off feature that will prevent you from accidentally turning the machine on, as well as a nice depth cut gauge that will let you know how much wood you are removing in a single pass. It even has foldable in-feed and out-feed tables that will provide you with extra support when it comes to working with large pieces of lumber. 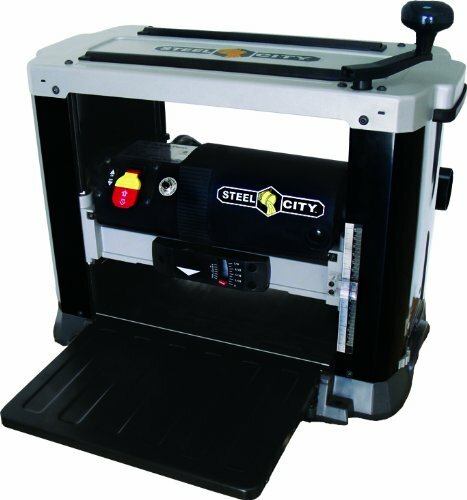 One of the most unique features of this bench top planer is that it uses a patented Helical Head cutterhead design. It features 26 four sided high speed steel cutters which spin at a rate of 10000 rpm and are powered by a high quality 15 amp motor. The advantage of using a helical cutter head is that provides you with a longer cut time and quieter operation Also, because the blades are staggered, you will see less incidents of tear out which will result in a smoother surface on your wood. Finally, one of the biggest advantages of this type of cutter head is that since the blade uses 26 four sided cutters, you can make individual adjustments to the blade if certain areas become dull. You just simply have to rotate the affected cutter to its sharper side. This feature prevents you from having to change out the entire blade like you have to do on thickness planers that do not use a Helical head. To improve the overall quality of your cuts, the Steel City Tool Works 40300H also has a Snipe Lock feature that decreases the amount of snipe in the wood by firmly locking the cutterhead assembly into place. The 40300H bench top thickness planer is a high quality portable planer that gives you the versatility that you need whether you are working on at home projects, or even out in the field on the job site. It’s portable design and advanced features including the Helical cutterhead, will allow you to cut your wood pieces to the exact specifications that you need. Where the best place to go to find a good price? Some of the best deals on the this portable planer can be found on Amazon.com. As of this writing, they even have deals that qualify for free shipping. If you’ve enjoyed our review, check out their latest deal. Pros: Runs very quietly while in operation. The in and out ramps are really long, this helps avoid any snipe issues. Boards pull through the planer very fast! Cons: The only real minus could be that there is very minor traces in between the location where the cutters line up, however a gentle sanding covers them perfectly.